If you're looking for a fridge it makes sense to pick a brand you can trust. After all, dependability is an especially important quality when it comes to keeping your food as safe and healthy as possible. Siemens fridges definitely fall in to the dependable category. Renowned for its high-quality German engineering, Siemens can be relied upon to deliver smartly designed kitchen equipment that's built with impeccable attention to detail. The brand's sleek, tastefully realised fridges embody this reputation perfectly, offering an array of stylishly understated models to fit every kitchen. 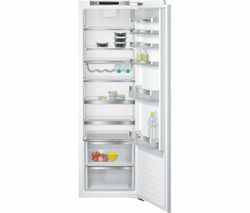 Whichever size of Siemens fridge you opt for you can be sure you're getting a refrigerator you can trust. 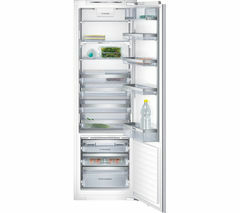 The popular iQ300 KS29 Tall Fridge highlights the space-optimising design you can expect from Siemens fridges. Perfect for family homes, this elegant fridge is a stylish addition to any kitchen and combines good looks with plenty of practicality. Offering an impressive 290 litre capacity and loads of handy storage features, the iQ300 KS29 utilises smart design to deliver a variety of storage options and a truly customisable interior that can be adapted to suit your needs and accommodate even the most awkward items. This ingenious fridge features a full-width salad crisper that's perfect for keeping fruit and vegetables fresh and delicious, a wine rack that allows you to safely store your glass or plastic bottles, and four door compartments that will comfortably house condiments and dairy products. 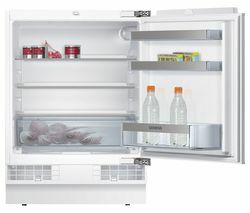 Quality Siemens design comes in a variety of fridge sizes - at the compact end of the spectrum, the small and perfectly formed iQ100 KU15RA51GB is the perfect under-counter option if space is limited. Considering its dimensions, you'll be amazed at the Tardis-like storage capacity offered by this little wonder of a fridge. Browse our complete refrigeration collection to see the latest chest freezer and fridge freezer models from leading brands including LEC, Hotpoint and AEG.